Buy Golspie Mill Peasemeal. Also known as Brosemeal 1kg in the UK from our online shop or directly from our independent Scottish store. Peasemeal (brosemeal) is a highly versatile, healthy and nutritious food used since Roman times and growing again in popularity. To make pease brose or just brose as it's also known. 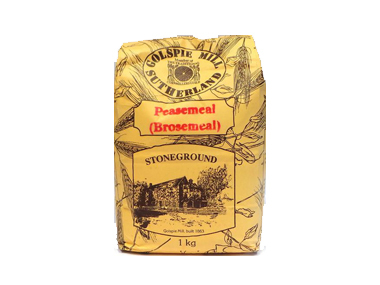 This product is unique to Golspie Mill in Scotland where it is made from roasted yellow field peas milled through three sets of mill stones to produce a fine yellow flour. Traditionally used for making peasemeal brose, (adding meal to boiling milk or water with a knob of butter and seasoning to taste) it has many quick innovative modern uses and can be used as a crispy coating for fish or chicken, adds a lovely flavour to white sauces, and makes very healthy vegetarian pate. We sell real Golspie Mill and other Other Flours directly from our shop in Scotland and online throughout the UK. View more products from Golspie Mill. Where can you buy real Peasemeal (Brosemeal) safely online? If you are wondering where you can buy Golspie Mill Peasemeal. Also known as Brosemeal 1kg safely online in the UK, then shop with us. Peasemeal (Brosemeal) - Golspie Mill Peasemeal. Also known as Brosemeal 1kg in Other Flours and Baking.